This Dramatic Oceanfront Home brings the Beauty of the Ocean Right into your Spacious Great Room! Conveniently located in Nags Head near the Gallery Row district at 10.6 Milepost this home Boasts a Hot Tub, 1,900 Sq. Ft. of Decks, Porch, & Boardwalk Leading Out to your own Private Dune Top Deck. This Cottage has Features that are sure to Create Great Family Memories that will Last a Lifetime! Ground Level: Parking, Steps to Entry, Porch Swing, Hammock, Kids Play Area, Charcoal Grill. & Fish Cleaning Table. Mid Level: 3 Bedrooms (1 w/King, TV, & Walk-In Closet, 1 w/2 Queens & TV, 1 w/Queen, Double, & TV), Full Bath, Screen Porch w/Furniture, Covered Deck w/Swing & Hammock, & Sun Deck w/Hot Tub & Enclosed Outside Shower. Top Level: Great Room w/Magnificent Ocean Views, Large Flat Panel TV, Game Table, Large Dining Area, Gas Fireplace, 2 Seating Areas, Fully Equipped Kitchen featuring an Extended Bar/Counter w/Seating Overlooking Vast Windows on the Front, Master Suite w/King, TV, Full Bath, & 2 Balconies, Sun Deck w/Deck Furniture, & Boardwalk to Dune Top Deck w/Built-In Benches & Picnic Table. Features include: C/AC & Heat, Washer/Dryer, Dishwasher, Microwave, Ice Maker, Ceiling Fans, Phones, Answering Machine, 5 CATV's, DVD's, Wireless Internet, Stereo/CD Player, & Baby Equipment (High Chair, Baby Gate, Port-a-Crib, & Pac-n-Play). No Pets. This home IS NOT in an area subject to the 2019 Nags Head beach re-nourishment project. Your home is beautiful, with plenty of room for two families! We have stayed in 3 different homes while vacationing in The Outer Banks. This home was BY FAR the most well equipped and organized home yet. This is the first house that we would consider staying at again so far. I loved all the labels throughout the house helping us navigate what was where, the ice maker was a huge hit, the decor is very tasteful and welcoming. The attention to detail was amazing! Highest praise to the homeowners. Their hard work and dedication in making this a great home really shows! This is an awesome family home away from home! The most well stocked & well maintained home we have stayed at. This home has everything! The location is great. The open space allows everyone to come together comfortably. The frozen yogurt place across the street makes it perfect! Beautiful home. Very spacious top floor with gorgeous ocean views through large windows. Homeowners have so many things for their guests to use (i.e. excellent fully-stocked kitchen, separate icemaker). A great house! 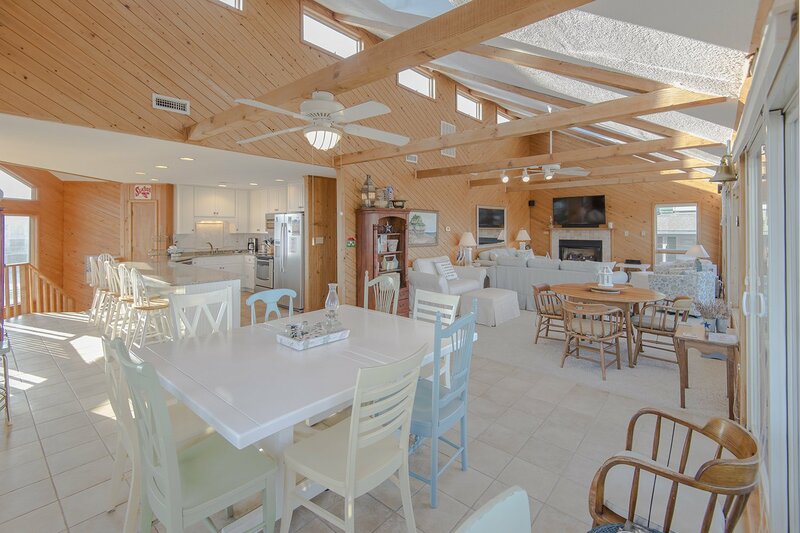 This house is delightful from the moment you enter- the perfect beach house for your family vacation. It's warm, yet spacious, has everything you could possibly need. There's easy access to the beach, beautiful views of sunrise and sunset. This was probably the best appointed house we've stayed at in in the OBX. The attention to detail in organization and including literally everything we might need during our stay was on par with the nicest 10+ bedroom homes we've been at. Thank you for such a well--equipped and stocked kitchen. Everything about the rental felt like a home and not just a functional beach rental. We've rented 99 at least 15 times over the years and always thoroughly enjoy our stay there. This home has an amazing view of the ocean and has a very nice open feel with its cathedral ceiling. Its unique architecture for the area is truly designed around maximizing views and living space on its top floor living level. The owners provide a generous range of kitchen equipment, utensils, pans and glasses. It's a very comfortable house and I've rented it 3 years in a row!